Edible Communities, North America's leading local food publisher with 90+ magazines in distinct culinary regions throughout the U.S. and Canada, has just launched online voting for its second annual 2016 Readers’ Choice EDDY Awards. Edible is well known for giving voice to local food trends through their vividly beautiful print publications. The community’s annual EDDY Awards showcase the very best content produced by its award-winning family of Edible publications, including profiles of local farmers and fishermen, artisans and chefs, eye-opening coverage of crucial social issues, exceptional magazine covers, illustrations, and photography. Publishers from San Diego to Philadelphia and Vancouver to Houston submitted more than 600 entries in 21 categories. While the public votes online for the Readers’ Choice winners, an independent panel of judges decides Critics’ Choice winners. This year's competition is being judged by 55 esteemed professionals in the food world including the Beekman Boys, Chef Virginia Willis, and Food52’s Kristen Miglore among others. Meet all of this year’s judges here. “Edible Communities’ publications are well-known for their passionate celebration of local food. Thanks to our outstanding editorial contributors across the U.S. and Canada, our pages and websites showcase today’s best food writing, photography and design. The EDDY Awards are a recognition of that commitment to editorial excellence. This online voting event allows our readers to acknowledge the stories that most impacted and inspired them,” notes Nancy Painter, Executive Director of Edible Communities. Voting for Readers’ Choice Awards ends June 8th at 11:59 pm ET at http://www.ediblefeast.com/eddyawards. Winners will be announced for both Critics’ and Readers’ Choice online and in social media on June 15th, 2016. Follow tweets and posts from Edible publishers, judges, and others using #EDDYAwards2016. 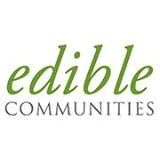 Since its creation in 2002, Edible Communities has grown to be the widely respected leader in the local food space, distributing an average of 1.4 million copies per issue in 91 local communities across the US and Canada. Through its distinctive licensing business model, individual entrepreneurs in defined geographic areas lead the creation of hyper-local content through the lens of sustainability and seasonality. With engaging writing, gorgeous design and photography, the brand was honored in 2011 with a James Beard Award for Publication of the Year. The Edible brand includes a PBS television show The Victory Garden Presents: Edible Feast; print, digital, podcasting, and local events.